Quba region of Azerbaijan is very rich with historical sites. Especially, mausoleums and mosques here are worth to talk about. One of the well- known mausoleums of Quba is undoubtedly, Sheikh Juneid Mausoleum located in Khazra (Sacred) village. The mausoleum was built for the honor of Sheikh Juneid- the founder of Azerbaijan Safavid dynasty. He was the grandfather of Shah Ismayil I, the legendary Azerbaijan king founded Safavid Empire in 1501. After Shirvanshah Khalilullah defeated and killed Sheikh Juneid in a battle, his brother in arms buried him around Khazra village. Later, Azerbaijan Safavid Empire united the country by annexing Shirvanshahs and Shah Tahmasib- the son of Shah Ismail I ordered to build a magnificent tomb on the grave of his grandfather. Plan of the Mausoleum has a door section on every four walls of a square-shaped building. It is 7.3 meters in diameter. Blue, black and violet white tiles set in square and chess-shaped form at 1.42 m high covers the tomb. Detective details of the interior are stalactites that provide a cross-section of square shape. In the center of the tomb there is a 15 m-high dome covering the building. Both the interior and exterior of the structure never fails to amaze its visitors. 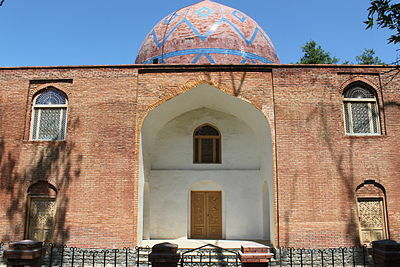 The grave of the Sheikh Juneid was moved to Ardabil city of Azerbaijan, the spiritual center of Safavid Empire in 16th century. Nevertheless, the mausoleum always considered as a sacred and important place. Hundreds of pilgrims visit the tomb every year to show their respect to Sheikh Juneid. Want to visit this Mausoleum? Then, create your custom tour here.